← 16 months and counting. This time last year I wrote a blog post on my old blog about the work we had done on our house. At that time we had no idea that we would be moving in a month and a half and going on the journey of selling that house. Now we are so happy to be in Tennessee. We love our house and neighbors and community and couldn’t have imagined how our lives would be just one year after I wrote that post. That old house– Pine St– will always hold a special place in our hearts. It was our foundation in Maryland. Our distraction from being far from family and friends. Our never-ending project. Our chance to grow in our confidence in ourselves– our abilities to be confident in our decisions, trust our guts, be proud of where we came from and where we were. Big changes happened in our hearts in that house. We learned not to worry what others thought. Not too many people had positive words for our house, and that was OK with us. We grew in that. We grew when we made decisions about renovations — how to manage money as young newlyweds, what to agree on, what to do first, how to figure it out. In honor of that first house and all it held for us I want to spend a little time remembering it. The first major thing we did in that house was a kitchen renovation. The house was not exactly up to our living standards when we bought it, so before we even moved in we worked on the kitchen, making it liveable. It was about 2 months before we wrapped that project up since we were both working full-time jobs and could only do work on nights and weekends. Starting at the top left: Tommy starts taking out the first cabinet. 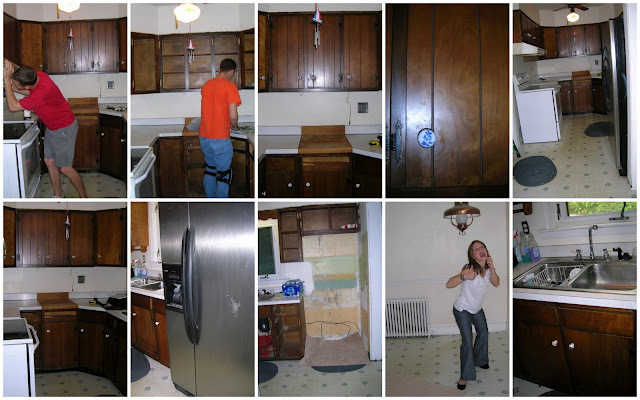 Goodbye old, ugly wooden cabinets! He removed all of the doors from the upper cabinets and removed the upper cabinets above the stove. He also wore knee pads, a lot, and wore those things down. The original hinges were so awful. The knobs were pretty but weren’t going to work with our look. Hello, view of the old kitchen. And yes, it was just as long and narrow as it looks here. And ugly. Bottom left: More views of the original kitchen. We actually moved the fridge over to the other side to help open the kitchen up. We moved the fridge to right behind where I’m standing looking like a total goofball. That was the day we did our home inspection. I was pretty excited. And a couple of before & afters. I LOVE looking at this! I LOVE how our kitchen turned out and was so so pleased with it. The kitchen is small so we knew we needed to brighten it up with lighter cabinets. We also knew we needed better countertops, flooring, and appliances. – Tommy brought down the nasty hood over the stove. NASTY. That’s all I have to say about that. – Next he started disassembling the kitchen. Doors off, taking out the old countertops, the sink, etc. – The knobs on the cabinets really weren’t so bad, I suppose, but at the time I really hated them. They definitely weren’t modern. – The floors were nasty! It’s disgusting to even look at pictures. 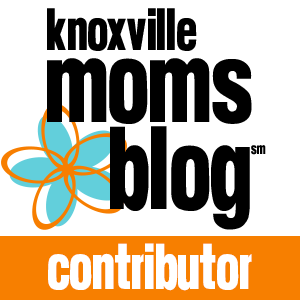 – We felt the need to put in a dishwasher so we had to move the fridge as the dishwasher had to go by the sink. Plus moving the fridge to the other side of the kitchen opened up the kitchen and helped it to not feel so small. 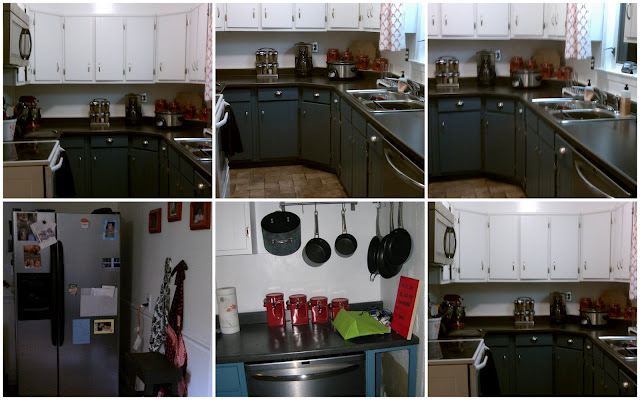 – When we moved the fridge we could see all the different colors this kitchen has been over time. It was built in 1948 after all. – Regret: in that dorky picture of me, I wish I had kept the light hanging right over my head. Not in that spot because it hung way too low, but I have several spots where I would have put it. Oh well. – Painted the upper cabinets white and the lower blue. 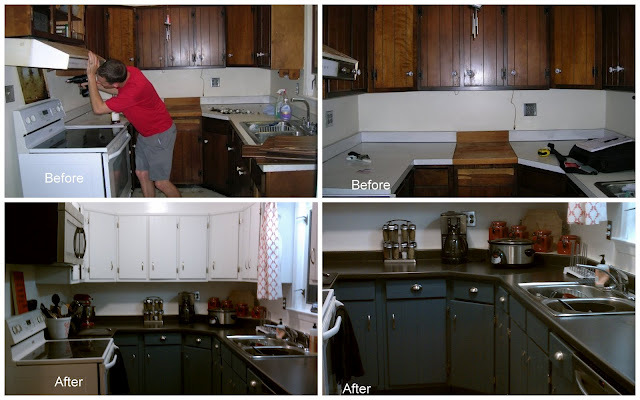 – Dark countertops — stock countertops from Home Depot, and my amazing husband installed them 100% by himself. He says he’ll never do that again. I tell him he did a great job. – Mounted a microwave above the stove. – New sink and faucet. – New dishwasher — first time this house had ever seen a dishwasher. – Moved the fridge to the other side of the kitchen to make it feel bigger. – Painted everything with a nice, crisp, clean coat of white paint. – New hardware on the cabinets. – New floors. The floors alone took the hubs about a week and a half to do because there were 4 layers of old flooring he had to pull up. You used to have to step up into the kitchen because there was so much old floor piled up. It took him forever, and he lost a lot of blood but he took care of it. And I love our kitchen floors — hides dirt so well!